The Fuji T-3 is a primary military trainer aircraft used by the Japan Air Self Defense Force, manufactured by Fuji Heavy Industries. Its first flight was in 1974. In the course of its service life, 50 units were produced. It is being replaced by the Fuji T-7. 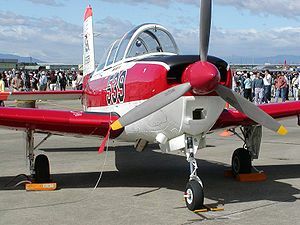 The KM-2B was a further development of the Fuji KM-2 (itself a four seat development of the T-34 Mentor with a more powerful engine) for use as a primary trainer for the Japan Air Self-Defense Force (JASDF). It combined the structure and engine of the KM-2 with the tandem cockpit of the T-34 Mentor, first flying on 17 January 1978. Fifty were purchased by the JASDF as the Fuji T-3, production continuing until 1982 . The Fuji T-3 served with the 11 and 12 Hiko Kyoikudan (flying training wings) of the JASDF. It is currently being replaced with the Fuji T-7, a turboprop variant of the T-3 with a 400 shp (300 kW) Allison 250 engine.